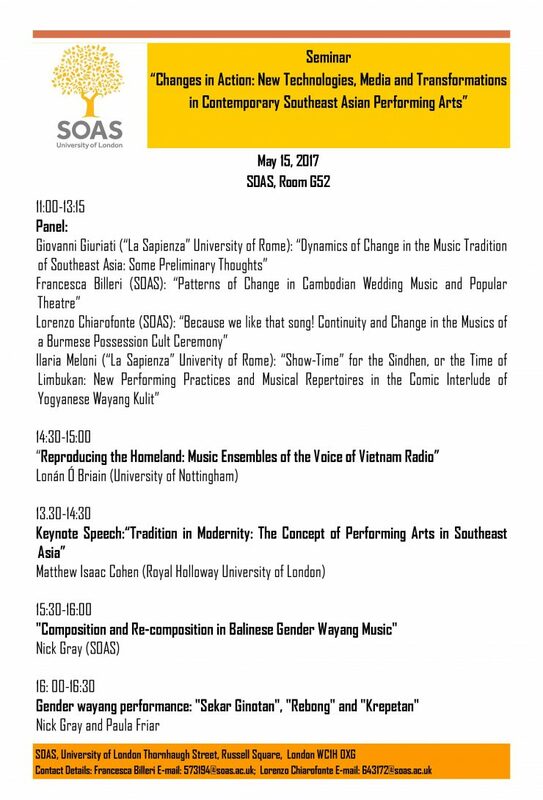 This seminar comes from the idea of exploring the ongoing processes of modernisation of Southeast Asian oral traditions: recent diffusion of technological and mass-media is affecting traditional music repertoires and theatre performances. Despite some regional traditions remain isolated and endangered, signs of renewal, including radical reinterpretations of musical​​​​​​​​​and theatrical forms take place. As a result, patterns of change occur in musical and social functions and performing practices in Southeast Asia. The seminar will also consider the adaptation of these traditions to new contexts (museums, exhibitions etc.) and the creation of new music compositions in the West. Through a comparative and interdisciplinary perspective, the seminar aims to reinforce the binds between disciplines in order to give an overview of dynamic relationships between tradition and modernity. Specialists of different expertise and backgrounds will be invited as guest speakers and conveners to ensure that the seminar is productively organized.